Not much time for blogging, lately -- I've actually had to work for a living this spring, dang it! 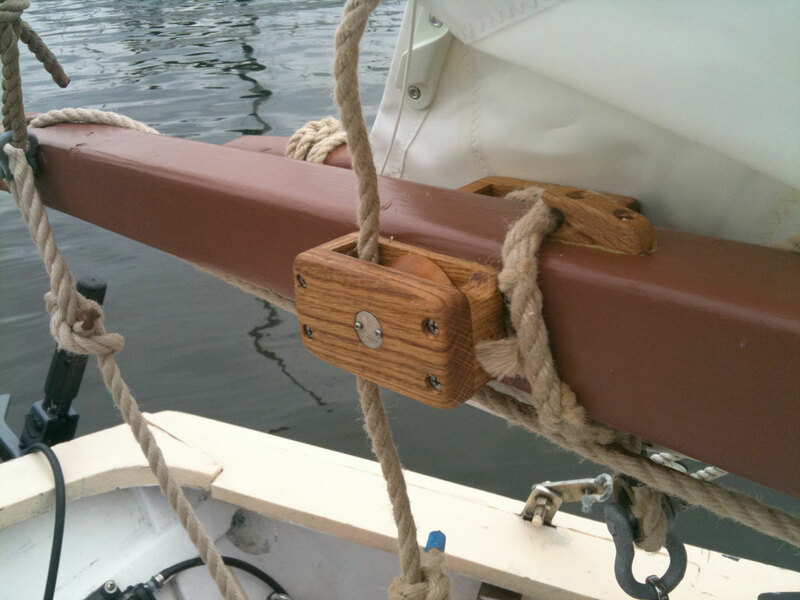 Luckily, I've been doing some iPhone/iPad software development, which is almost as interesting as building and sailing small wooden boats. I've devoted my few spare hours to beefing up the Blue Moon's running-rigging. The goal is to make all the working bits both strong and functional. Since I've never done anything like this before, its been a voyage of discovery, captained by the great Tom Cunliffe via his book Hand, Reef And Steer . The picture below (from Google Books) shows the general direction I've been aiming at. From Tom Cunliffe's "Hand, Reef, and Steer"
I was never happy with the Blue Moon's reefing gear, which always seemed a bit flimsy for her big mainsail. It never actually failed on me, but during a blustery night passage on the west coast of Florida, it did worry me, so I've been looking forward to beefing it up. 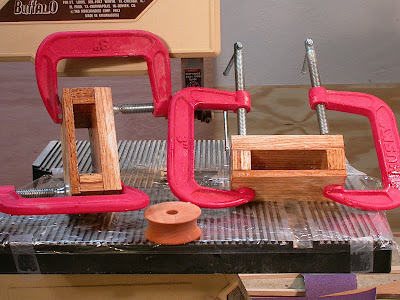 Tom's basic idea is to use two cheek blocks, one on each side of the boom. The reefing line goes up through one of the blocks, through the reef cringle in the sail, and back down through the other block. The advantage is that you can always work on the windward side of the boom, by dead-ending the leeward end of the line. Not only is it easier to work on the windward side, the sail doesn't get pulled down into the block, as it can when you are pulling down on the leeward side. It's all explained in Tom's book, which you can sample above. A must-have book for traditional boat lovers. 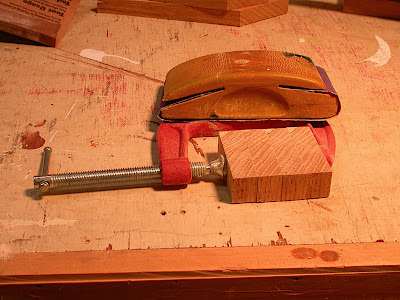 Of course, I'd never made a cheek block, but it didn't seem too difficult, so I just jumped in with both feet. Always the best way to learn something, I think! Like most cheek blocks I've seen in pictures, hers have no inside cheek -- the pin goes right into the boom. I didn't like the idea of drilling a hole -- even a shallow hole -- in my boom, so I decided to use a thin, but strong, inside cheek. 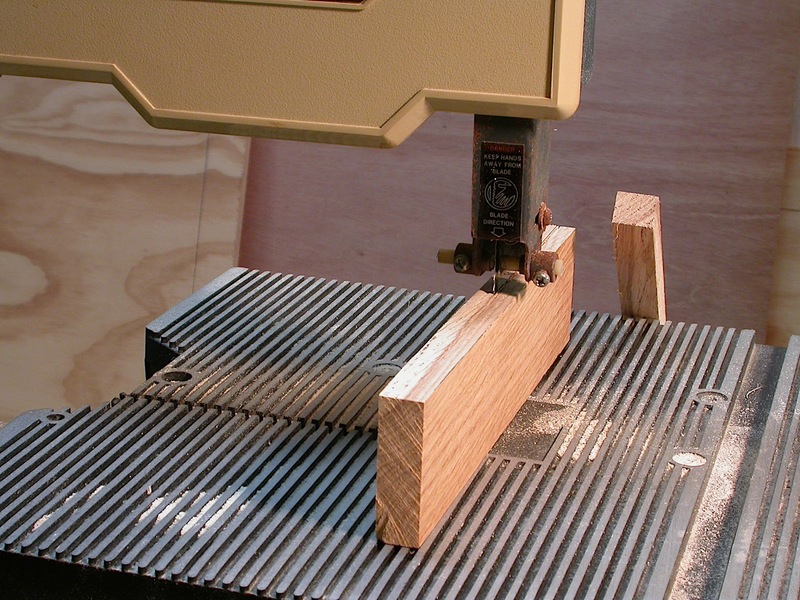 To get it, I had to tackle my very first re-sawing job! Here below are my 4 cheeks: two fat outside cheeks, and two thin inside cheeks. The next problem was the spacers. I'd already figured out how to do this. 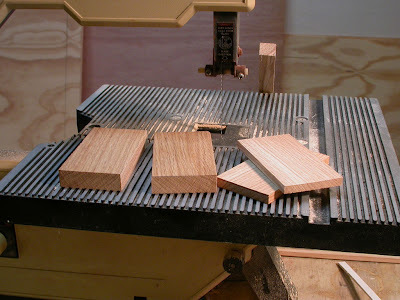 Just cut out the 4 spacers (for two blocks), clamp them together, and both sides until they are all the same thickness. Then it was time to pull out the epoxy and glue up the blanks. I used thickened West Systems epoxy, again left over from Cabin Boy. Note the plastic wrap to keep everything from sticking together. 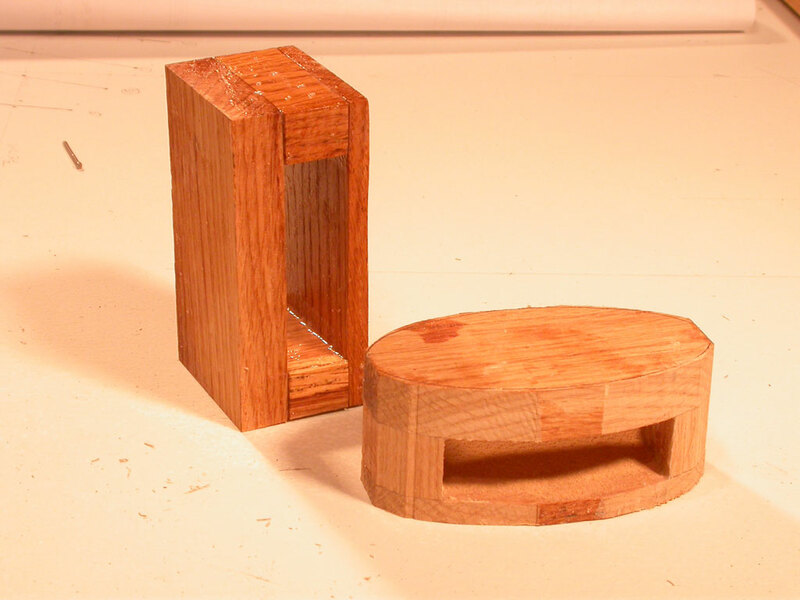 My first plan was to shape the cheek blocks into ovals, but after making the rough cut, it suddenly occurred to me that I didn't have enough 'meat' left on the ends for 4 screws. It looked fine on the drawings, and maybe there was enough room -- just -- but it didn't look right to me, so this one ended up in the Unlikely Boat Builder's Museum of Instructive Failures. I glued up another blank to replace the failure. Ah well. That experience taught me a good lesson: drill your holes before starting to shape the block. That will help tame your natural eagerness to trim, trim, trim. Even without much trimming, the finished block looked pretty nice, I think. Here are all the bits and pieces cut out and finished, just before assembly. To cover the end of the pin, I used one of those Canadian dimes with the Bluenose Schooner on the reverse side. Sorry, Canada! It's your fault for minting the perfect coin for the job! I've included two goops in this photo for a good reason: I have suddenly awoken to the importance of goops in a proper boat shop. 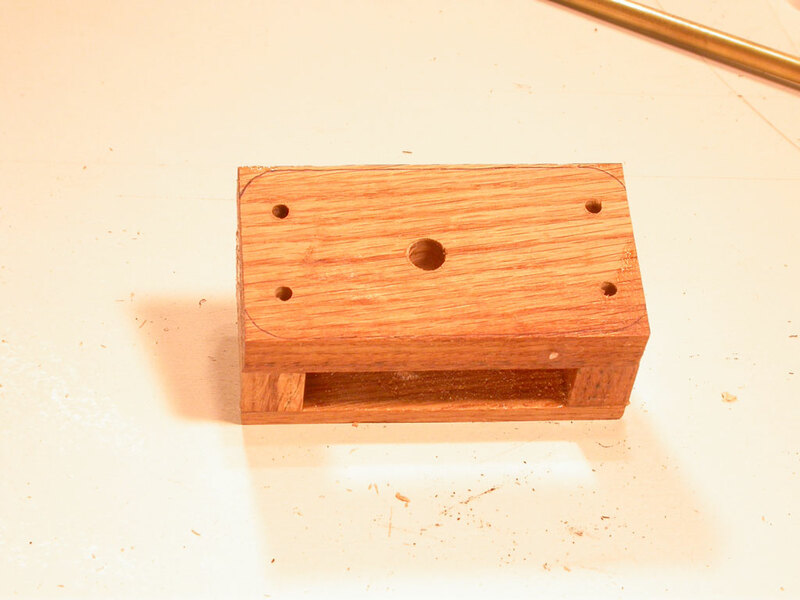 First, I must take back my previous 'idea' about using linseed oil as the main lubricant in my blocks. This, in hind sight, was a pathetically naive idea that someone should have called me on. 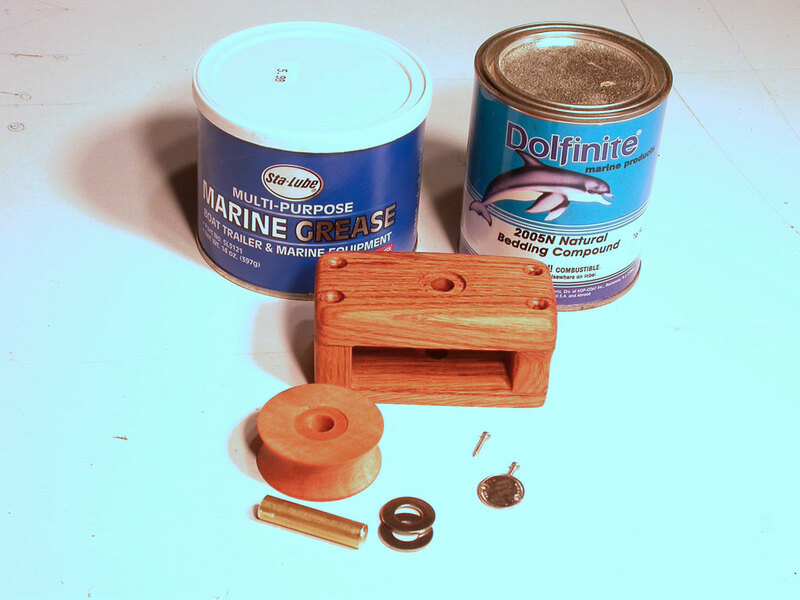 Unless you want to oil your blocks every few days, you need to grease them with a heavy-duty water proof marine grease. The stuff they use on boat trailer axles will do fine. You can find it in any automotive store. Second, I am done, done, done!, with those modern bedding compounds (3M 4200, etc.) that come in tubes. Sure they work great, but I never need more than a dab of the stuff at a time. There's nothing more aggravating than to open up a $17 tube of 4200, knowing that the next time I need it, the whole tube will be a solid mass, no matter how tightly I close it up and wrap it. The traditional bedding compound is slower to dry, but stays fresh in the can for at least a year, I'm told. A dab here, a dab there, and you only pay a few cents per dab, rather than $17/dab. An expensive lesson that took me far too long to learn. 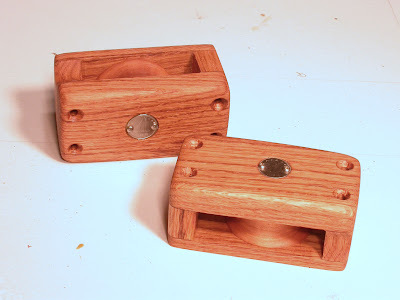 Anyway, here are the two assembled cheek blocks, glistening with their linseed oil finish. And here they are, bedded down and screwed into the boom, one on each side. I had a chance to try them out the other day, and I must say they made the job of reefing so much easier, and a lot more fun! As I said, you dead-end the leeward end of the reefing line with a figure-8 knot, and then haul down on the windward end. I can either tie the end off on my new, oak boom cleat (not in photo, alas), or in a real blow, I could use the outhaul tackle to pull it down. So, another small improvement, done! Speaking of beefy boats, I spotted a very nice wooden boat in Huntington Harbor the other day, and rowed over to say hello to her owner, Bob. 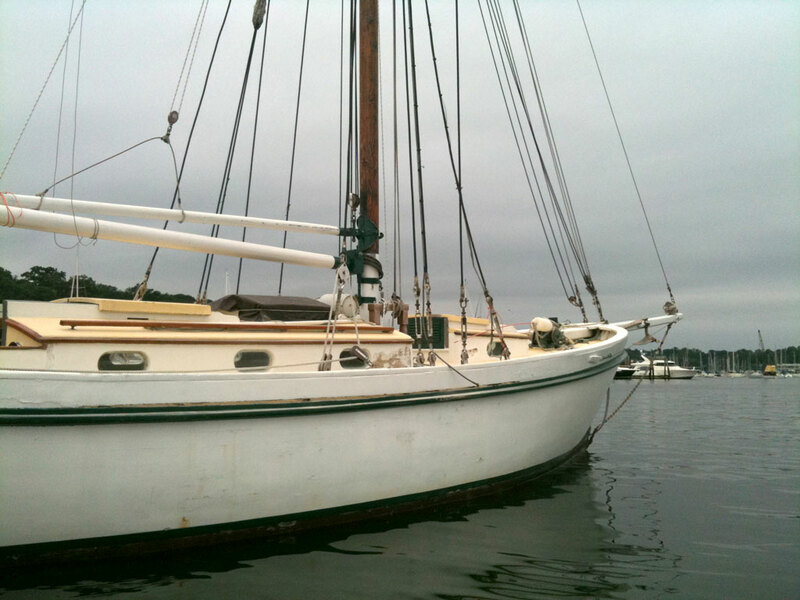 She's a John Atkin "Vixen", and a real beauty she is. Of course, William Atkin had his first boat shop in Huntington, a long time ago, so Bob and I had a great chat about Atkin history. 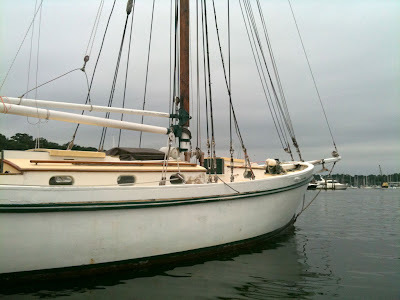 Another Vixen just completed a circumnavigation, with two small children onboard, and I was happy to speak briefly with her busy young owners at the Wooden Boat Show, this weekend. A beefy boat, indeed. Huh. It's a small world. Thanks for the story, Ralph. Every one of your blogs is a learning experience for me. Love the cosmetic touch of using a couple of our dimes on your cheek blocks. I truly enjoy your blog. Yes, I should have taken a close up of the mounted dime. It really does add that extra touch. BTW, for you coin collectors out there, I used newer ones... didn't have the heart to drill holes in an old silver one. Nice to have you back John, have missed your inspiring blog. Thought you must have sailed off into the sunset. Not quite, but I did have the most perfect sailing day on Wednesday... Blue skies with 10-15 knots, gusting up to 20. Beautiful! Pat Atkin was also asking me about Storm at the boat show. She wasn't aware of the boat and wants some more pictures/details. If we're all talking about the same boat, I'd like know know more about her. Ralph, you say she isn't really a Vixen? Know anything about the designer? I'm going to leave a note on here next time I row out, to see if I can meet up with Bob and take some pics for Pat. Are you on LI, Adam? John, i live in Lancaster pa. I always thought that storm was a vixen with a few changes by the builder. if you see bob, please make him aware of this great coincidence. 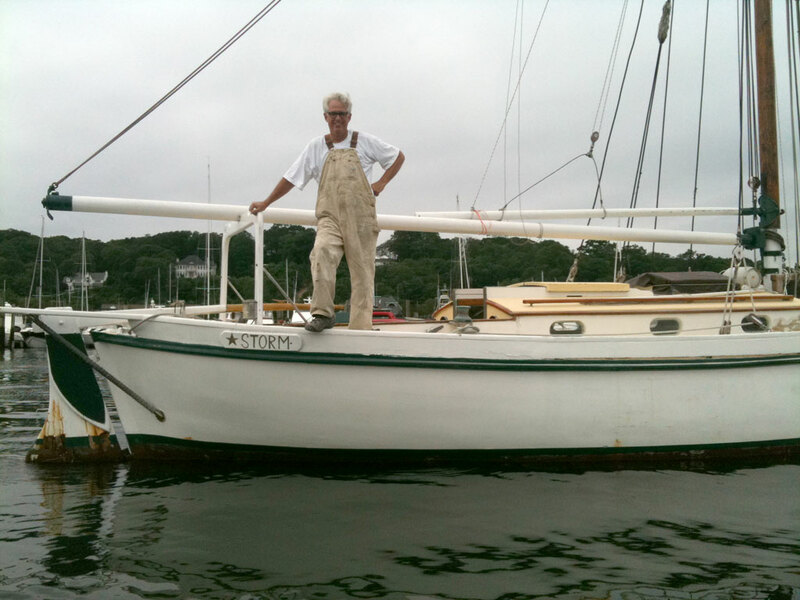 i have a dream of getting Ralph, myself, bob, and Wilmes (the builder) out on storm for a quick sail. I decided to google Vixen Storm to see were she was and your site came up. My Father Dan owned Storm in early 90's for two years and we took her from Connecticut to Ocracoke Island and up into the Bay.